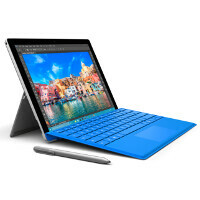 An update sent out to the Microsoft Surface Pro 4 enhances the stability of the tablet when it is hooked up to the Type Cover. The accessory not only protects the tablet, it also is a physical QWERTY keyboard which turns the device into a laptop. The firmware update disseminated is version 1.1.420.0, and is being sent out OTA in phases by Microsoft. This means that the update won't be received by all Surface Pro 4 owners at the same time. The Surface Pro 4 Type Cover is available from the Microsoft Store for $129.99. It is available in Black, Blue, Bright Blue, Red, Teal and Onyx. For $30 more, you can purchase a Type Cover that not only comes with the physical QWERTY, it adds a fingerprint scanner to the accessory's features. If you own the Surface Pro 4 and employ the Type Cover, keep your eyes peeled for the update. If you don't own the Type Cover, but always fancied one, you can purchase it from the Microsoft Store by clicking on the sourcelink. Wait What? It Can't Get More Physically Stable And Why Would A Software Stability Update Only Work When There's A Type Cover In Use. So It Will Be Less Stable When Not Using One? Probably 'cause it's for the situation where a user decides to quickly detach and reattach the Type Cover for whatever reason, potentially 'causing confusion/interference in the system and making the Type Cover not function at it's best. For example, on my Surface Pro 2, I've been in the situation where my Type Cover 2 becomes really touchy when I unfold it from Tablet mode. Figured it was due to the connector detaching slightly from my Surface Pro 2 when I fold it completely back (covering the kickstand). Unfolding it results in the touchpad being more touchy than normal and no longer responds to the tap-tap-drag gesture. Quick fix is to detach the keyboard for 5 seconds and reattach it, however, a software stability fix would be more useful in preventing it from ever getting so touchy. This problem doesn't exist with later devices 'cause keyboard always remains securely attached. Thx For The Clarification I Understand Now. I've Never Owned A Tablet With A Type Cover So I Wasn't Aware Of The Problems You Could Have While Using One. Almost like a docking station. If you f with it to fast, it can do stupid things. I see it all the time on laptops here at work. And once you get it in that mess up mode, you hear the person attach and detach several times over and over and over. I've occasionally had issues on my SP3 where didnt recognize the keyboard at all and I had to detach and reattach several times. I don't know why this round Windows 10 OS stability is not rock solid like the last few Windows update. I still don't dare to put my production at Windows 10. To me Windows 8.1 is still the current most stable Windows OS. Depends on pc I suppose. My pc has always been clean, no bloat, and not a single OS update since XP has wrecked my pc. Before I moved to my raid just a few months ago, my harddrive was one from xp machine, same partition etc since vista on up. The only thing I am running into right now, is it seems insider program likes to mess with my driver for display, turning videos green unless I am in opera browser. But on normal non insider windows its fine. Gotta find the stupid setting its fing with. Then again my card is now some 7+yrs old...maybe time for an update? I have a high performance notebook that is equip with 32GB Ram, a GTX 980M running Windows 10 as a test unit, only Microsoft Office, Visual Studio 2015 enterprise edition, no third parties software, no Chrome, no Google services, no Valve Steam, purely Microsoft. For your information, Microsoft Windows Update did mess up that unit twice. I have to reinstall Windows 10 and all those software. This has never happen in the entire Windows platform life cycles. I am puzzled what kind of under the hood changes Microsoft did with their code base or not as well test like before. I am hoping Windows 10 is an isolated incident, in fact I am thinking Microsoft may need to market Windows 11 to restore back customer confidence. I have had 0 stability issues. My main PC has been running 10 in the insider program since January and I have had no issues on it, not a single teal sadface screen of death(which i have gotten on my SP3 occasionally while running Warcraft 3 TFT). Good for you! Windows 10 is good enough for normal user. Specialise groups that value stability and compatible are well advise to wait a bit longer. I don't think any admin in their right frame of mind would put production on Windows 10 for now. Nothing I have tried to run on it(games wise) has been incompatible. In fact, Fallout 3 and New Vegas are most stable and install better on 10 than they do Windows 7. Why MS not offer the new Type Cover for free to those who had the previous 'unstable' one.